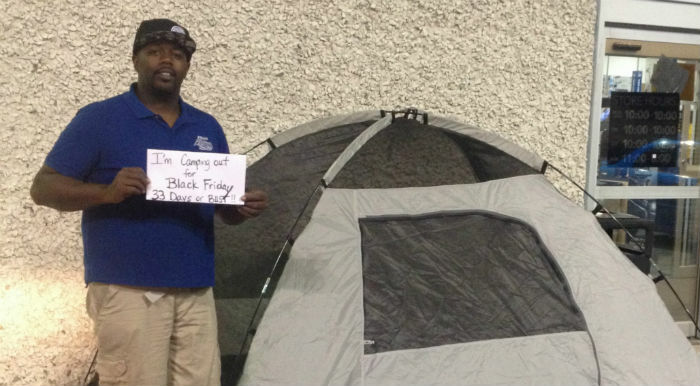 Kevin Sutton is camping out at a Best Buy in Orlando, but he's hoping for more than just a doorbuster. Like Christmas music, Black Friday hype seems to start earlier and earlier every year, along with those lining up to capitalize on advertised doorbusters. In 2013, shoppers lined up nine-plus days before Thanksgiving in Akron, Ohio to prepare for shopping at a Best Buy. Last year, two women in California blew that out of the water by starting their campout a whopping 22 days before Black Friday. Not to be outdone, this year Kevin Sutton started camping outside a Best Buy in Orlando, Florida on October 25, a record-breaking 33 days ahead of Black Friday. But he's not doing it just to snag a doorbuster. Here's the kicker: Sutton is on a mission, but it might not be the one you'd think. Sure, he wants to find some electronics at a great price. But more importantly, he wants to raise awareness about homelessness. He's collecting toys and other items that will be given to children in need just in time for the holidays. And apparently, he's been busy doing other things, too. On November 2, he tended to a gunshot victim in the Best Buy's parking lot, using first-aid skills he says he picked up from The Walking Dead , according to the Orlando Sentinel . This isn't his first Black Friday rodeo, either. Sutton, a radio host in the Orlando area, camped for 15 days ahead of the shopping holiday last year, and managed to collect three tons of food during that stint. This year, he wants bigger and better. Referencing his successful collection last year, Sutton told WKMG-TV, "If we can do the same where we've got to get a U-Haul, it's all going to these kids, right here in central Florida." So readers, what do you think? Would you camp out for a cause like this one? Or would you prefer to raise awareness in another way? Sound off below! Thanksgiving & Black Friday 2015 Store Hours: Stores Are Pushing Back! Kudos to Kevin! I admire his BRAVERY! In this day and age there is NO WAY you'd find me camped outside in a public place with no one else around! If a cop was stationed outside my tent, I might consider it! I wish him well. I hope he needs TWO U-Haul It trucks full of toys for the kids! This is a brave man, Orange Blossom Trail, OBT, the road where this Best Buy is located is the best place to find a lady or the night or a gun shot wound, like the example above, in Orlando. It is also a high homeless area so he isn't camping outside the Best Buy by Mall of Millenia in Orlando, FL where you're a stones throw from multiple million dollar homes. He is right where the problem is and where the help is needed! I'm 45 minutes north of this location so I will be stopping by this weekend to drop off some donation! It's a person like this that just makes the world a whole lot better place. Sometimes you think that this country is going to hell in a hand basket. And then something like this happens and it warms your heart. And to know that this isn't the first time he is doing it. I think people like him are the saints of this world. These are the people who deserve Nobel prizes. To follow in his spirit, I will drive to Orlando and donate to his cause. I am sure my kids could do with fewer toys anyway. I agree with @smusherface. I wouldn't be able to do this, but I think it is awesome that he is, and a great way to raise awareness. If we all did at least one small thing for someone in need this holiday season the world would be a better place, though we should all practice charity everyday. Way to go Kevin Sutton! Props to you! God bless this man. This is what Christmas (& the other holidays) is really about. Most of us have tend to think only of ourselves & those closest to us & in most cases - we already have more than enough. I know we all can't do what this man is doing but maybe each of us could just do one thing for someone who needs it more than we or our loved ones do.